Introducing all mighty, healing, alkalized, ionized Kangen water. Originally from Japan, but introduced to me while lying on a bed in a sacred hydrocolonic therapy session in Ubud, Bali 3 summers ago. It was on this bed that I learned (and then learned again one year later,) that my body was working to fight off an overgrowth of candida and bacterial yeast. It was no wonder that I was displaying the symptoms of an acidic environment - prone to illness, poor immune strength, overgrowth of yeast, poor sleep patterns, fatigue etc. Although my entirely organic, mineral dense plant based vegan diet (at the time…not so much anymore - i now splurge a lot) was doing absolute wonders for my health and overall vitality, it wasn't over compensating for the mass amounts of poor quality drinking water I was consuming out of my brita filter for the past…22 years. My holistic doctor told me that acidity was building up in areas of body and I was no longer in a state of alkalinity. And thus, the blackhole vortex of online research began. Fortunately, there are scientists and medical doctors who have done the trial and error for us. Dr. Otto Warburg won the Nobel Peace Prize in 1931 for proving that cancer cannot survive in an alkalized, oxygen rich environment. He says “Every single person who has cancer, has a pH that is too acidic.” But his research (and many others,) discovered that it wasn't just cancer - but also all chronic and degenerate disease, infection, illness, bacteria and yeast that cannot survive in an alkaline environment. As Keiichi Morishita explains in his book "Hidden Truth of Cancer," as your blood becomes too acidic (anything under pH level 7.0,) your body will move this acidic substance from the blood to your cells, thus allowing the blood to return to a healthy pH level of 7.35. However, as a result of this process, all of these cells become too acidic and in some cases, begin to die. The cells that survive however, become abnormal cells that cannot correspond with your brain or DNA, typically referred to as “malignant” cells. These cells will grow continuously. These are cancerous cells (source). Condition – Acne: 1. Rinse with pH 11.5 Strong Alkaline Water to remove excess oils from the skin. 2. Cleanse with non-soap cleanser and pH 4-6 Mild Acidic Water. 3. With a cotton swab dab pH 2.5 Strong Acidic Water on any active blemishes or broken skin. 4. Tone with pH 4-6 Water in a glass bottle with a fine spray mister. 5. Repeat morning and bedtime. 6. Tone multiple times per day to keep skin hydrated. Condition – Eczema and Psoriasis: 1. Rinse with pH 11.5 Strong Alkaline Water to remove excess oils from the skin. 2. Cleanse with non-soap cleanser and pH 4-6 MildAcidic Water. 3. With a cotton swab dab 2.5 Strong Acid Water on any broken skin. 4. Tone with 5.5 Beauty Water in a glass bottle with a fine spray mister. 5. Repeat morning and bedtime. 6. Tone multiple times per day to keep skin hydrated. Condition – Rashes and Burns: 1. Rinse with pH 11.5 Strong Alkaline Water to remove excess oils from the skin. 2. Cleanse with non-soap cleanser and pH 4-5 Mild Acidic Water. 3. With a cotton swab dab 2.5 Strong Acid Water on any broken skin. 4. Tone with pH 4-6 Mild Acidic Water in a glass bottle with a fine spray mister. 5. Repeat morning and bedtime. 6. Tone multiple times per day to keep skin hydrated. Condition – Diaper Rash: 1. Cleanse with non-soap cleanser and pH 4-5 Mild Acidic Water & pat dry. 2. With a cotton swab dab 2.5 Strong Acid Water on any broken skin and let dry. 3. Hydrate the skin with pH 4-6 Mild Acidic Water in a glass bottle with a fine spray mist setting. 4. Repeat after each diaper change. Diaper rash begins with urine and feces that are too acidic. To prevent diaper rash begin by making certain that your baby is properly hydrated with pH 8.5-9.5 Alkaline Drinking Water. Next replace baby wipes with a container filled with soft cloths or unbleached paper towels and Mild Acidic Water. Use to cleanse diaper area each time you change your baby, pat dry and then apply a very fine mist to the skin. This assists in keeping the pH of the skin balanced. Caution—Step Away From The Antiperspirant: Sweat is one of your body’s natural methods for ridding itself of toxins, so stopping that natural function can create a serious backlash in your lymphatic system. Odors are simply bacteria thriving in the dark, damp area. So to stop the odor simply mist with pH 2.5 Strong Acid Water. If you tend to sweat a lot keep a small spray bottle in your purse or desk drawer for occasional touch ups throughout the day. 2. EYE WASH: Rinse eyes with an eye cup. Upon removing the eye cup from its packaging, soak in Strong Acid Water (pH 2.5) for 1-2 minutes to clean and disinfect. Rinse the eye cup thoroughly with Strong Alkaline Water (pH 11.5) Fill the cup, following package directions, with Strong Alkaline Water (pH 11.5) Place cup firmly around one eye, keeping your eye open, tilt your head back and gently roll your eye as though you were attempting to look up, down, and from side to side. Continue this for approximately 1 minute. Now that you have completed one eye, toss the water away. Rinse the eye cup thoroughly with Strong Acid Water (pH 2.5) Repeat steps for your other eye. To maintain healthy eyes follow this protocol 1-3 times per week. When working to improve any eye condition, follow this protocol at least 2 times daily and up to 10 times per day. 3. GREASE IN EYE: Spray 11.5 as needed to soothe and heal eye. 4. MAKE UP REMOVER: Spray on eyes to dissolve and remove make up. 5. PUFFY EYES: Spray on to eyes to reduce puffiness. 6. HOT BATH SOAK: Use one gallon of 11.5 added right at the end of filling the tub. This replaces Epsom Salts or any other remedy. This works even better if you have the Anespa from Enagic. 7. ALLERGIES, COLD SYMPTOMS, SNORING: Use as a nasal wash when sinuses are plugged. Due to the reduction in inflammation of nasal passages this technique can also reduce snoring! 8. BUG SPRAY REPELLENT, SUNBURN, PAIN, BUG BITES, SWELLING: Spray or soak areas with towel soaked in 11.5 and keep wet by adding small amounts of 11.5 to the towel for a minimum of 30 minutes twice a day...better if one hour twice daily. 9. HEAT BURN, INDIGESTION, FOOD POISONING, STOMACH FLU: Drink ¼ cup FRESH 11.5 immediately followed by 25 ounces of 9.5 then do not eat or drink anything for 45 minutes. Repeat the next day only if necessary. 10. ARTHRITIS, GOUT, MUSCLE SORENESS OR TISSUE INJURIES: Since high alkalinity draws out acids, you can utilize 11.5 to soak in to “pull out” acids associated with inflammation, injury and pain. 11. HANGOVERS & MIGRAINES: can prevent hang overs, as soon as feel migraine coming on, drink several oz. 12. CHEMOTHERAPY: Drink the water with chemotherapy. The benefits are that side effects are lessened, it reverses metabolic acidosis, and the antioxidants are good for any point on chemo. Put 11.5 on the skin twice a day for burns from chemo. 13. STROKE: Drink as much as able if feel a stroke coming on to provide potent alkalinity to overcome severe acidosis causing the stroke. 14. FRUITS & VEGGIES: Soak for a minimum of 5 minutes to clean off pesticides. 15. ICE CUBES: To help off-set acidic drinks. 16. RICE, BEAN, LEGUMES: Soak for 5 to 10 minutes and rinse clean with low flow 9.5. 17. MEATS: Soak all for 5 to 10 minutes for cleaning and tenderizing. 18. LAUNDRY SOAP: Use 1 to 2 quarts per load in place of laundry soap. Works beautifully for greasy smells like Fast-food Restaurant work clothes. 19. STAINS ON CLOTHES, RUGS, CARPETS: Use as a degreaser for any type of cleaning. Clean oil based stains by soaking the area and letting sit for 10 to 20 minutes and then blot out of carpets and wash if laundry stain as mentioned in step 17. 20. CLEAN OVEN, CLOGGED SINKS & TUBS, REPLACE 409 CLEANER & DRANO: Clean with a scratch pad. Replaces 409 cleaner when dissolving grease and grime in kitchen. Use instead of Drano or other chemicals for clogged sinks and bathtubs. 21. POLISH SILVER: Soak and polish. 22. PAINT THINNER: After using oil base paints, use to clean up. 23. USE INSTEAD OF “GOO GONE”: Removes greasy, gooey, gummy, sticky problems. 1. KILL ALL MICROBES: Pre-rinse all fruits, vegetables and meat and let sit for one minute before soaking in 11.5. This will kill all microbes. Will also kill MRSA and infections. 2. DISINFECTING: Use for disinfecting anything. 3. ANTI-BACTERIAL SOAP: Use in place of anti-bacterial soap. 4. HARD WATER SPOTS & RUST: Clean hard water spots off of chrome and rust off of metal. 5. FACIAL LIFTING & TIGHTENING: Spray face and neck (not eyes) and rub skin upward until dry. Finish with Beauty Water to tone skin. 6. BRUSH & GARGLE, RESOLVE PERIODONTAL DISEASE & THRUSH, PREVENT ROOT CANALS: Wait one minute and then rinse with 9.5 water for 30 seconds to restore the natural pH. This procedure will prevent or resolve periodontal disease & thrush, & avoid root canals. 7. VOMITING: To stop vomiting take 1-2 Tbsp. 8. OPEN WOUNDS, BURNS, INFECTIONS, STOP BLEEDING, KILLS CANDIDA: Kills bacteria and pathogens. Use on cuts, scrapes to help stop bleeding. Clean twice daily until healed. Do not use any other ointments as they only attract microbes by keeping the area moist and sticky. 9. INFECTED SINUSES: Spray in nose 2x/day for 2 days. Wait 2 minutes, then flush with 11.5. 10. NAIL FUNGUS: Spray twice a day or soak. 11. PINK EYE: Spray infected eye several times thru the day and will clear up. 12. SORE THROAT, STREP THROAT, COUGH: Gargle 3-4 times per day or put in spray bottle and spray into throat. 13. POISON IVY: Spray on infected area as often as needed. Will slow down itching and dry up poison ivy much quicker. 14. FEVER BLISTERS, CANCER SORES: Spray or gargle to stop and dry up both. 15. MOLES & WARTS: If you see something abnormal on your skin you may want to soak a gauze pad on a band aid with the 2.5 and apply over the area. Change the band aid at least once a day. Often this process requires 30-60 days before seeing results. 1. Drink with meals only if necessary. 2. Use for making baby formula. 1. FACIAL SOAP: Clean face twice a day. Spray after cleaning. 2. HAIR CONDITIONER: Spray hair after showering as this conditions your hair. Try not to use conditioner of any kind as this coats the hair. 3. TONE SKIN: Use as final rinse in shower or bath to tone and firm skin. 4. RASHES, DIAPER RASH: Spray on skin to soothe and heal rashes, including diaper rash. 5. PETS: Bathe pets for more lustrous coats. 6. PLANTS: Water indoor and outdoor plants for vigorous growth. Can revive dying plants. 7. EGGS & PASTA: Use to boil eggs and pasta. 8. FREEZING FOOD: Spray on foods before freezing including fish and shrimp so that foods do not lose their flavor. 9. ANTHOCYANINS: For washing and preparing fruits and vegetables containing anthocyanins: plums, grapes, cherries, strawberries, red cabbage, eggplant, soy beans, asparagus. 10. FABRIC SOFTENER: Use in rinse cycle during laundry. One gallon per load. 12. REPLACE WINDEX: Replace all window and mirror cleaners with Beauty Water. 13. HARDWOOD FLOORS & CERAMIC TILE: For polishing and housecleaning: hardwood floors, ceramic tiles, etc. 1. SOUPS: Cook all soups with 9.5 water. 2. STIR FRY: Stir fry with 9.5 to steam. 3. WEIGHT LOSS: Drink before you snack and before meals...wait 30 minutes and eat meal or if still hungry eat snack... most people are so dehydrated that their thirst mechanism is so weak, that they think they are hungry. 4. GREY HAIR: Often can return original hair color. 5. VISION: Can improve eye vision. 6. SPIDER VEINS: Over time of drinking the water and cell repairing, spider veins can improve. 7. AROMA THERAPY/SPRITZER: Put any herb like rosemary or lavender in a spray bottle filled with Kangen water, let set for a couple of hours and use as a spritzer in your house for aroma therapy and an air freshener. Getting Started Drinking Kangen™ Water: It is recommended that everyone who chooses to drink Kangen™ water start by drinking the 8.5 pH water. The Kangen™ water is obtained by pushing the blue button on the front of the machine. Multiple pushes will move you through the three different levels of the Kangen™ water that are produced. This water is dispensed through the TOP flexible hose. Drink at least ½ of your body weight in ounces each day. If you do physically demanding work, participate in strenuous athletics, or are dealing with “sickness issues”...you need to drink more Kangen™ water to help your body move towards and achieve homeostasis. In these situations, it is recommended that you drink at least ¾ of your body weight in ounces, and drinking 1 ounce per pound of body weight per day produces real “miracles”. It is my observation that those people who drink a minimum of ¾ of their body weight in ounces of Kangen™ water per day see the quickest results. 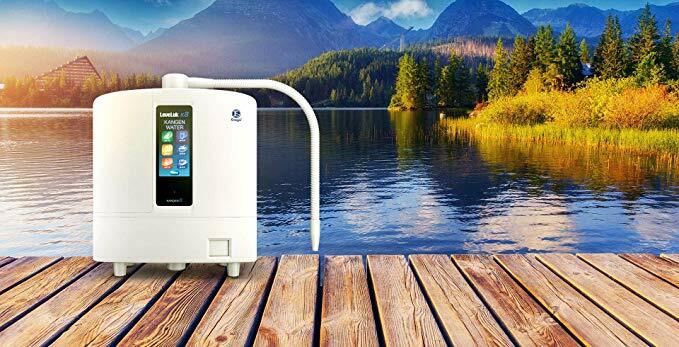 After successfully drinking the suggested amount of 8.5 pH water for two weeks (“successfully” means that you are not experiencing any discomfort while drinking the water...other than frequency of urination), then you may choose to increase the water pH level up to the 9.0 pH setting. Continue drinking the suggested amount of water at this setting each day for at least two more weeks. After successfully drinking the suggested amount of 9.0 pH water (again meaning that you are not experiencing any discomfort while drinking the water other than frequency of urination) then you may choose to increase the water pH level up to the 9.5 pH setting. Occasionally we find people that experience “cleansing” symptoms. These are typically caused by the body releasing stored toxins and acidic wastes. If you experience any “cleansing” types of symptoms (such as headaches, skin eruptions, loose bowels, coughing, etc.) when you start on the 8.5 pH water, then you should increase the amount of water you are drinking to help neutralize and flush the toxins from your system. If you experience these symptoms after increasing the pH of the water you are consuming, then go back to the last pH setting that you were able to drink without experiencing these symptoms and increase the amount of water that you consume until these symptoms stop. If the reaction gets too severe, one should back off of the pH but INCREASE the volume of water ingested.